I got a couple of new followers from my last post on vinegar, and a great comment from blog friend Aunt Kathy. Welcome to my humble little foodie blog! I should give you an update on the HeatCageKitchen garden: it’s growing stuff. Not much, but growing stuff. I’m going to be getting some bell peppers this year! It’s a pepper! With more on the way! 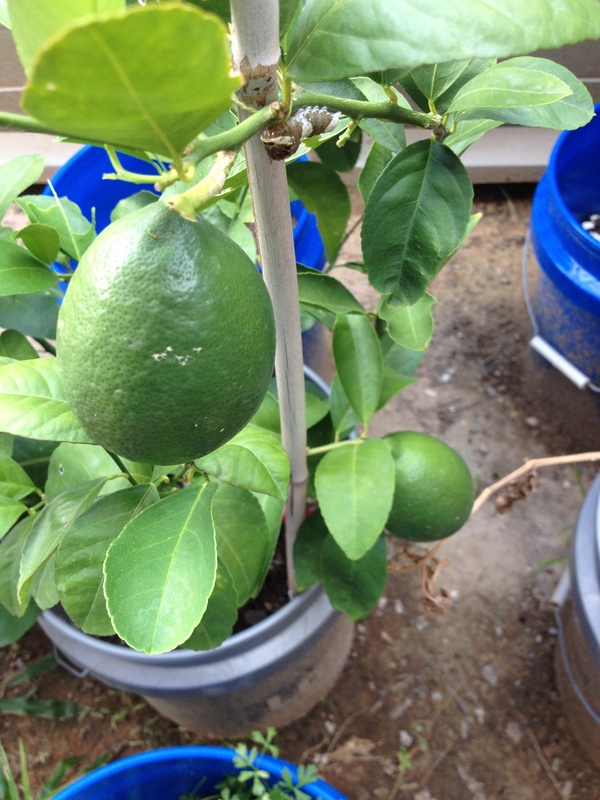 No tomatoes or limes, but there are four, count ’em, FOUR, Meyer lemons growing out there. They’re green right now, and getting bigger all the time. I was hoping for more, but four is better than nothing, right? Two of the four anxiously awaited Meyer lemons. More pictures when they’re ripe. 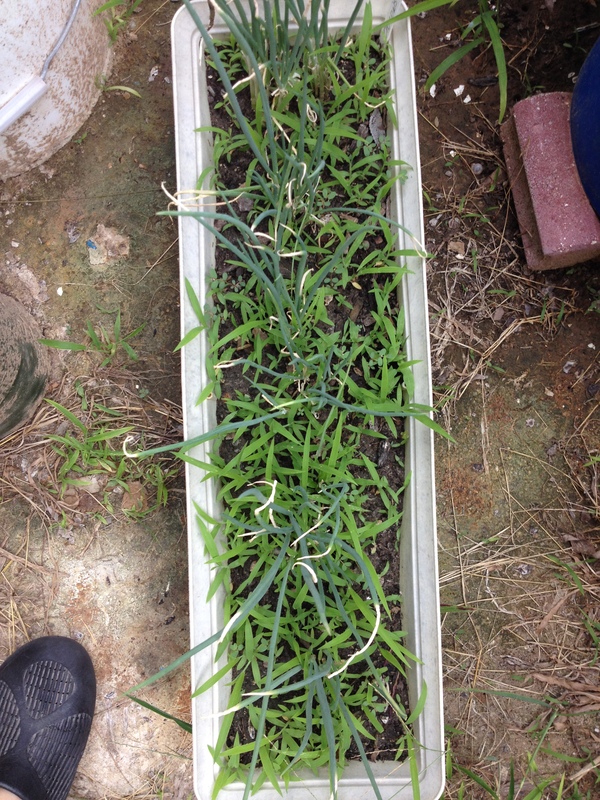 My recent garden weeding did some good, but the weeds are getting back into the green onions. Long as you know which plant is which, you’re good; make sure you don’t get some weird stuff in your pesto, you know? I need to get back out there and pull more weeds out again. Darnit. I’m tellin’ ya, green onions are so easy to grow–cut the white, rooted bottoms off the ones you get in the grocery store and stick them in some soil. They grow–just cut off what you need, don’t pull them up. The ones I’m growing have been in that same pot for 4 years. They were the big ones, but they grew back skinny. I don’t care, either. Sure, green onions (aka “scallions”) are relatively inexpensive, but when you want to make your favorite recipe that calls for them, isn’t just easier to go out to the garden and cut them for free? Scallions. . .along with the green, green grass of home. And one of my clodhopper slippers. 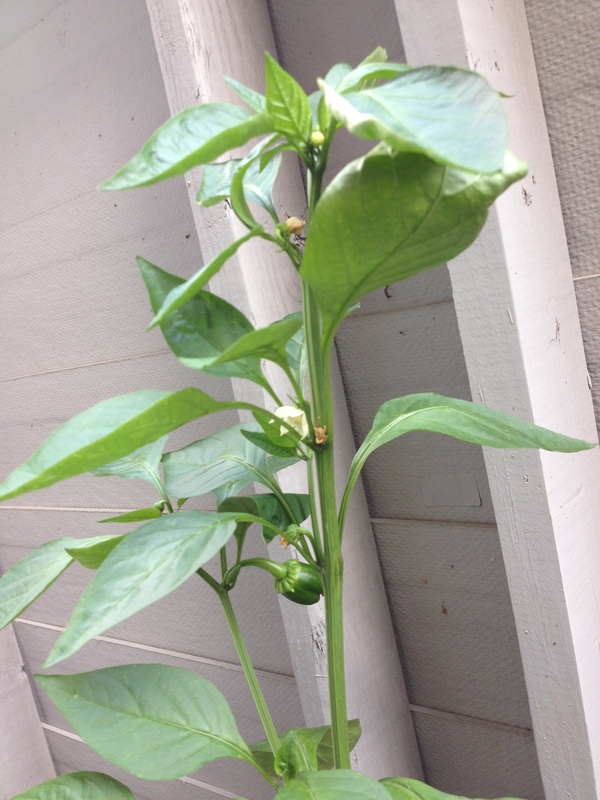 And one more garden picture, the surprise Anaheim chili pepper I didn’t know about until a few days ago. Woo hoo! I just went out there to water and noticed it growing. Well, it’s all green, you see. . . . Surprise! More of these babies coming, too. Chile peppers of all kinds are prevalent in the southwest, from the popular Jalapeno to the Serrano to the Scotch Bonnet. We love chili peppers in this part of the country. (But I do not like burning hot food, ever.) 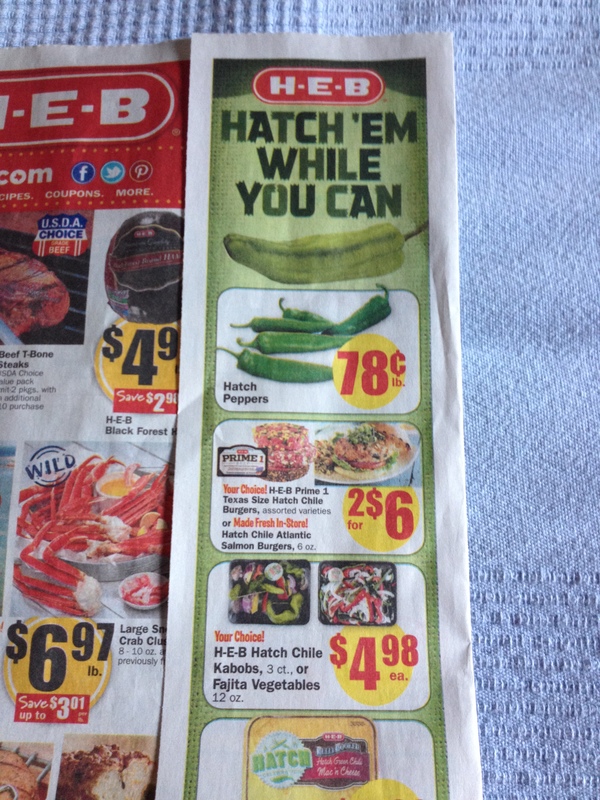 In fact, I saw some “Jalapeno Poppers” in the meat case at HEB just the other night. They’re stuffed with cream cheese and wrapped in bacon. No, I’ve never had them, not interested. If you’re not in the Southwest, you might not know what I mean when I say “Hatch Chiles.” Well, let me tell you all about it. . .March of 2012, I was on a week-long trip to Albuquerque, NM, when a man my colleague was talking with on the plane told us about the “chili sauce” that they put on everything in New Mexico. He said, “You have to watch out, because they’ll put it on ice cream if you let them!” We said goodbye to him, as he was going to get a rental car to drive to Durango, CO, which he said was easier than flying to Denver. We heeded the warning and were aware of it whenever we went to eat somewhere. And he was right, we were asked, “red or green?” in several eateries. No kidding, they sell this at both HEB and Central Market. 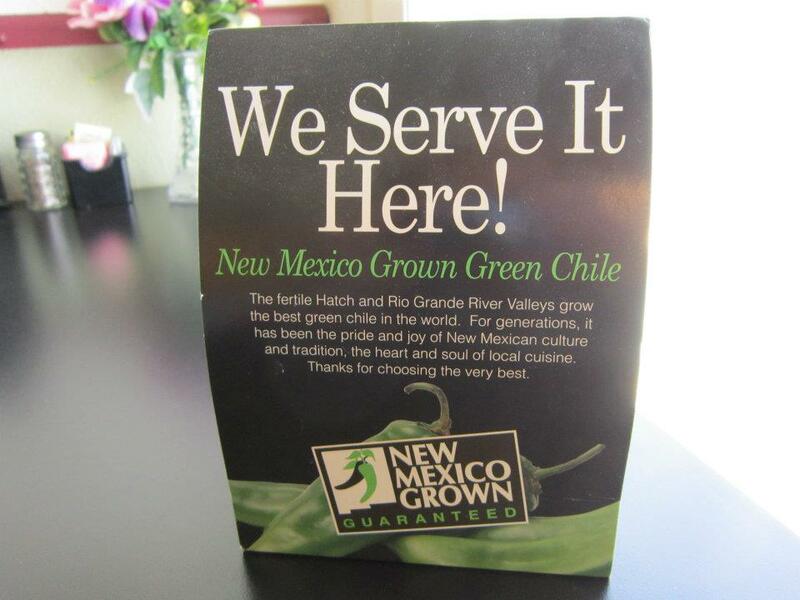 Like cherries, Hatch chiles are not available for very long, so that’s why they make a big deal about it. 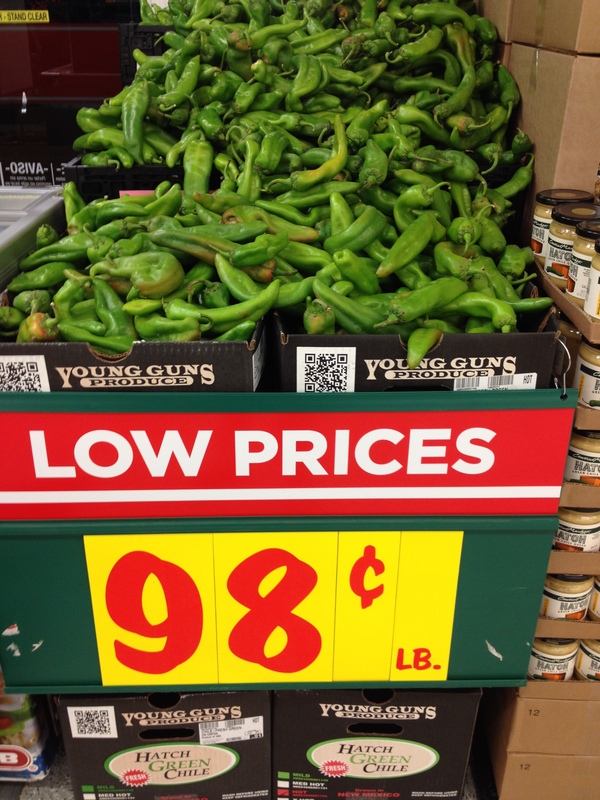 And unless you have actually been to New Mexico, love this kind of stuff or otherwise jumped on the Tex-Mex bandwagon, you likely will say, “Meh.” You can read more on Central Market’s blog post on Hatch Chile Peppers. 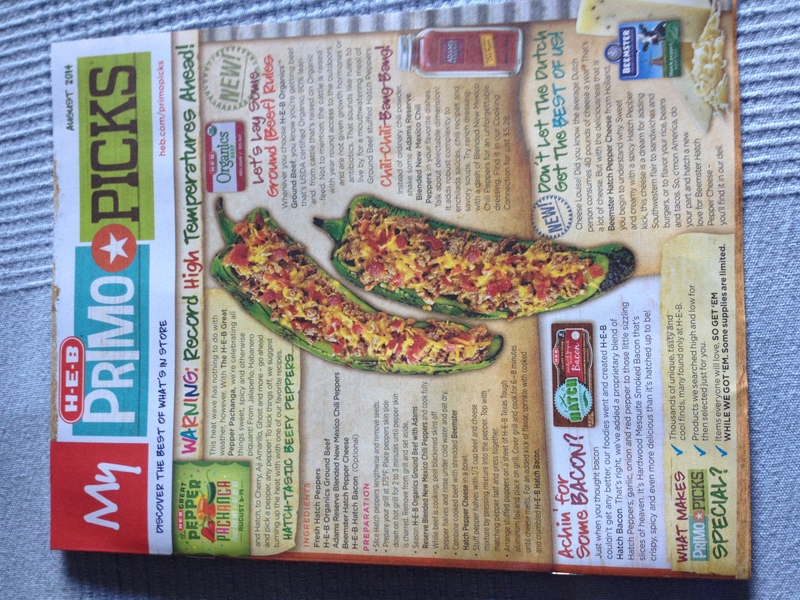 This is Primo Picks, a little magalog that goes out separate from the HEB sales flier, with recipes and introducing new products. Don’t these stuffed Hatch peppers look DELICIOUS?? I’ll make them, one day. 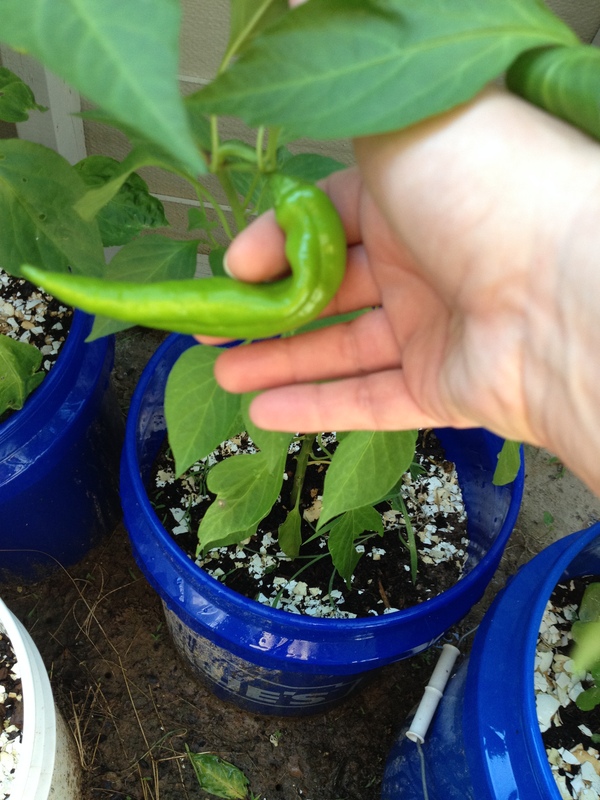 This type of chili can grow to be a good six to eight inches long, and ranges from green to red and warm to medium-hot, depending on how long it’s been on the tree or in the grocery’s produce section. This is what they looked like the other night in HEB. The magical mystery fruit, Hatch chile peppers. Doing a little research, just a little, told me something I didn’t know before. 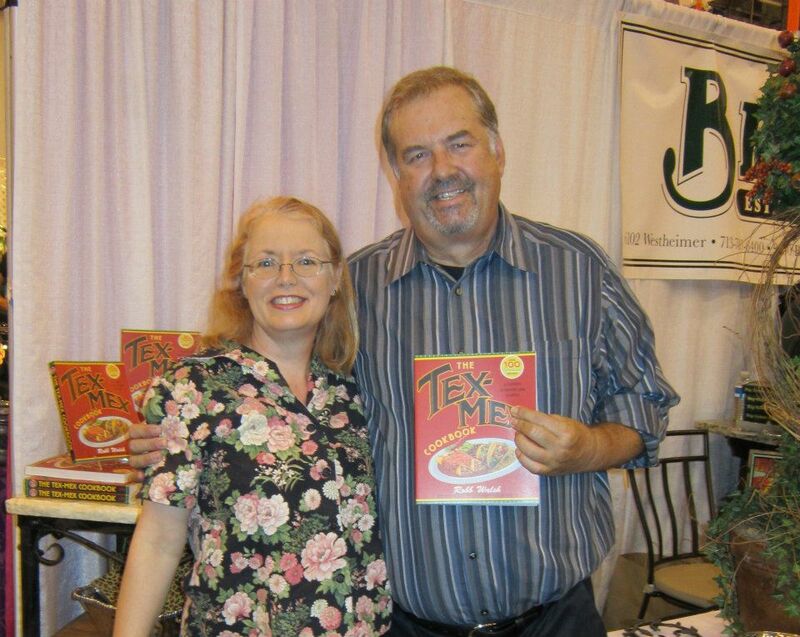 I think I’ve mentioned meeting cookbook author Robb Walsh a couple of years ago at the Houston Metro Food & Entertaining Show. I bought his book, The Tex-Mex Cookbook, at the show, and asked him to autograph it. Well, of course he did! 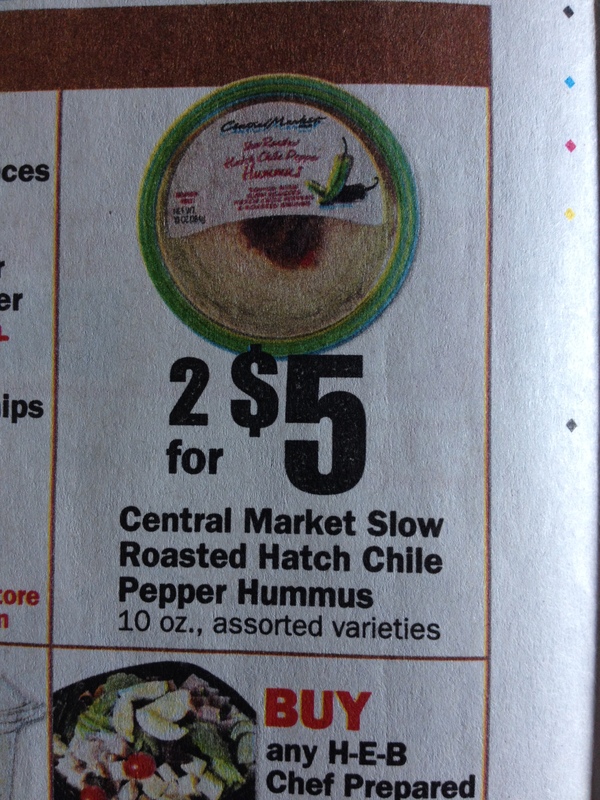 I took a peek at the index, and whatddaya know, on page 7 it talks about Anaheim chile peppers. The name comes from the cannery opened in Anaheim by a farmer named Emilio Ortega who brought the pepper seeds back to his native California from New Mexico, where they thrived. Look familiar? Right there above the tomatillos. . . . Yes, Dear Readers, they are the same thing. One batch is now on sale for 78 cents a pound until August 12th, the other $1.98 a pound, available year-round. (I don’t normally buy a pound at a time.) And I’ve got one growing in the HeatCageKitchen garden, too, and I hope more to come. Well. . .it’s not exactly Watergate, but there’s something you didn’t know before. Still, it’s an industry New Mexico is proud of, and rightly so. A reminder to buy American! Despite suffering from altitude sickness most of the time I was there and a couple of other things that got under my skin, I can honestly say Aunt Ruth and I really enjoyed it–the conference, the people we met, and of course, the FOOD! I would love to go back to New Mexico one day and visit for the whole week, but that’s going to be a while. I also hope to go back to Arizona one day, where I went exactly one month after returning from Albuquerque. 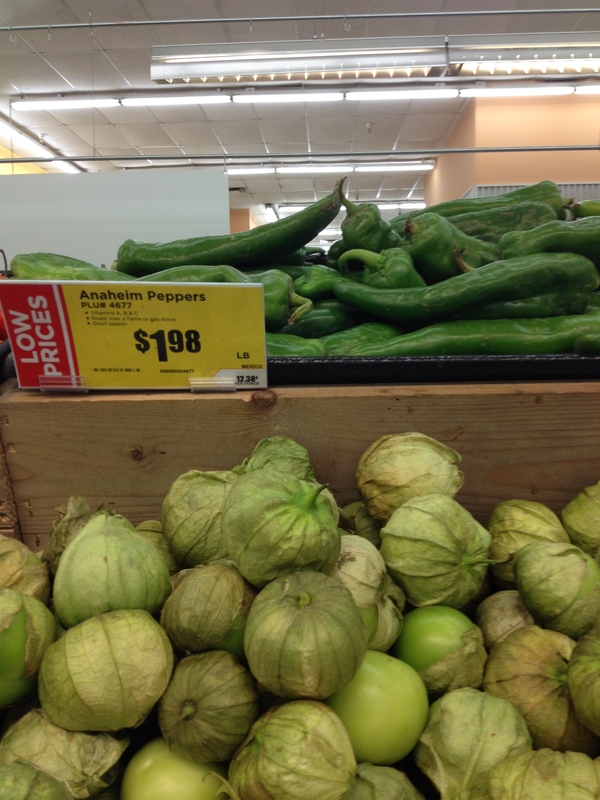 Now, seeing as it’s summer, I’m going to tell you WHY I like these Anaheim/Hatch peppers. Salsa. Not just any salsa, either. Back in 1991, a couple of years after leaving California but just before I started at Tulane University, I saw a book called The Well-Filled Tortilla by Victoria Wise and Susanna Hoffman. Such a cool cookbook, and very California, right? Well, I borrowed it from someone who moved away and we both forgot about it. I’m sure he didn’t miss it, and I’ve still got it. My favorite recipe from this book is Orange-Onion Salsa on page 49. I made it once and have loved it ever since. The recipe also says you can use grapefruit in place of the oranges, so I’ve made it frequently to use up the grapefruit on my Butsudan. Just a few ingredients, and you can be dipping away in no time. Heck, I just eat it with a spoon! Peel the oranges (or grapefruit) and cut into 1/4-inch dice, removing any seeds as you go. In a bowl, mix together the oranges (or grapefruit), onion, chopped chile pepper, cilantro and cumin. Serve right away, or cover and refrigerate; use within one day. That’s all for now, but next up I have some updates on gluten-free, including <cough> government regulations on gluten free anything. But most of it is good. Posted by Amy on August 8, 2014 in Cookbooks, Fresh from the Garden, Grocery Shopping, Ingredients, New Trends, What's for Dinner?